If you have been asked to speak at a funeral, having a sample death resolution to follow can help you stay within the expectations of the church and family. The resolution of respect is a formal way of honoring someone who has died. 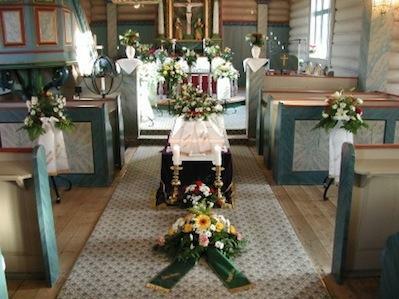 During the funeral, a death resolution and a eulogy may both be given. The difference between the two is the formality and presentation. A eulogy is often presented by a very close friend or family member and can be informal and spoken directly from the memories of the person speaking. The eulogy is a freely written speech with no format. A death resolution is formal and written to the specifications of the family and the church in a specific format of 'whereas' and 'therefore' statements. A funeral resolution is often written and given by a colleague, fellow church member, or a community leader. A death resolution may be kept as an official record in the church's archives or community records. The first goal of a death resolution is for a group of people to show their deep gratitude and respect for what the deceased contributed in their lifetime to the family, community, church, or employer. The second goal of a death resolution is to acknowledge that the deceased had an impact for good and that those mourning their passing will promise to do certain things in remembrance of the deceased. The death resolution can be prepared by the group and then delivered by the one person who will best represent the group. A funeral or death resolution should be written prior to the funeral and approved by the family and clergy. The following is a sample death resolution in which you can insert the specifics about the deceased. Below are several options of the sample death resolution in which you can insert the deceased name. The introduction may vary based on who is offering the funeral resolution. "We the members of (name of the church), want the family to know that our hearts are full as we gather together to say goodbye to a valiant woman, (insert name of deceased), the mother of (list names of children) and loving spouse of (name of spouse). We have great respect for (name of deceased) and her family, as they are very active participants and followers of Christ (Next, read a scripture appropriate for a funeral)." "We, the colleagues of (name of deceased), want the family to know that we gather together with them to mourn the passing of a great man. (Name of deceased) contributed much to the community and betterment of society (Read a poem or scripture about serving the community)." "We, the employees of (name of company), wish to express our gratitude and respect for (name of deceased). No poem or scripture is necessary." "Whereas; (name of deceased) demonstrated a great faith in Jesus Christ and a commitment to their church and family." "Whereas; (name of deceased) was a great father and provider for his family." "Whereas; (name of deceased) worked with diligence and vigor to achieve the goals of the company." "Whereas; the passing of (name of deceased), a great community leader, has caused a deep void of sadness in the community." "Whereas; (name of deceased) served God and community well and faithfully." 'Whereas; (name of deceased) was a faithful woman of prayer who served the Lord." "Whereas; (name of deceased) loved her family and served with a gentle spirit of long suffering." "Whereas; (name of deceased) suffered much physical pain in his lifetime that none of us will ever fully comprehend, yet lived in such a manner to touch each and everyone one of us with their great example of love and acceptance." "Therefore be it resolved, that we as a community will mourn with the family and continue the great work of (name of deceased)." "Therefore be it resolved, that we embrace and mourn with the family because all of us have a common bond." "Therefore let it be known, that we can't replace (name of deceased) but we will attempt to improve our lives and live our lives as demonstrated by the great example of (name of deceased)." "Therefore let it be known, that we know the deep loss and sorrow your family is experiencing. We want to share in your sorrow but recognize that the Lord has accepted into his presence and good and faithful servant." This part of a sample death resolution is the conclusion and a good time to make a final statement of condolence and commitment to the family and community. One of the 'therefore' statements above can be used and elaborated upon in the final conclusion.